Ive discovered, while researching various things for the kids' homework, is that you can type in the beginning of a question on Google and see what the most popular derivatives of that question are. At first, it was humorous. Now, I've retracted any faith I once had for our society. Today the question I went with on Google was “Am I…” to see what the most commonly asked “am I” questions are. Here are the results. 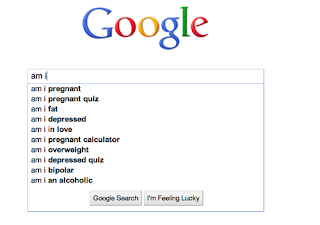 I think what we can all take away from this is that we’re all relying a little too much on Google. We’re forgetting about common sense. I’m afraid we’re going to evolve into a society who can’t figure anything out on their own without Google, to the point where we can’t even figure out what the Google website is because we need to Google it first. 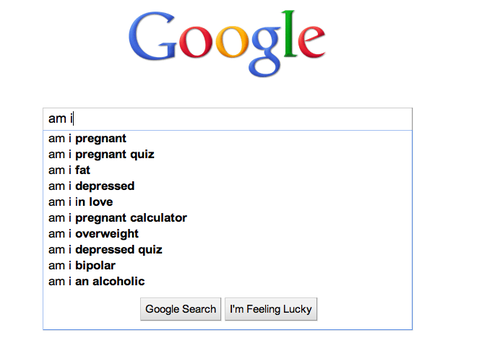 Regarding “am I pregnant.” Ladies, if you’re Googling this, get off your computer and into a free clinic. Trust me, every second counts. And “am I fat?” This is an easy one. You don’t need to Google this. Look down.